This webcast tackles the huge management challenge presented by conflicts of interest (COI). Based on OCEG’s GRC Capability Model, integrated GRC capabilities can enable the full disclosure and management of each COI according to the risks it presents. Join OCEG and Convercent as we discuss how to integrate and perform the key types of actions, controls and systems that support a robust and defensible COI management strategy as a core capability of Principled Performance. 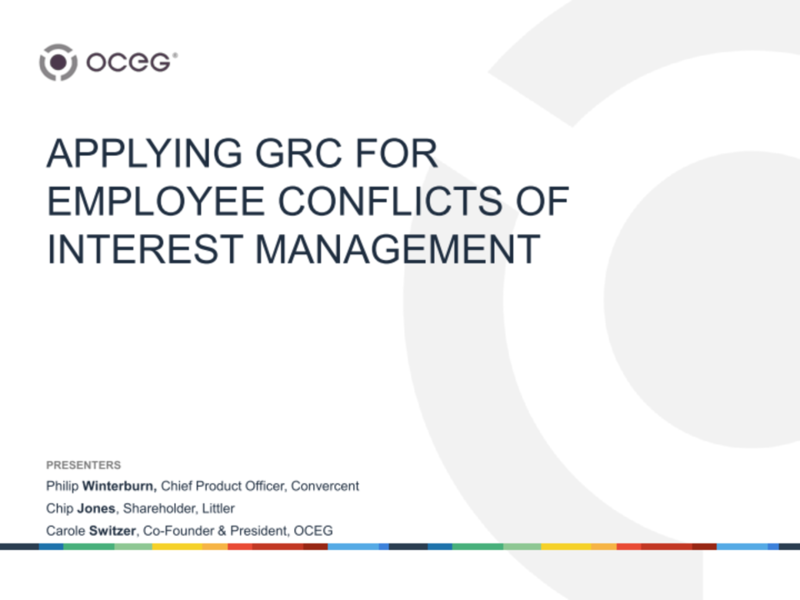 We have emailed instructions to access GRC for Conflict of Interest (COI) Management Slide Deck to . Make sure the email arrives in your inbox: either add "support@oceg.org" as a safe sender to your email platform, or if you use Gmail, drag our email into your Primary tab.